During pregnancy there is an alteration in maternal immunity within the uterus where innate, proinflammatory immune responses are tightly regulated to prevent immunological rejection of the fetal allograft. Disruption of the delicate balance of cytokines by bacteria or other factors increases the production of proinflammatory cytokines at the maternal-fetal interface and activates the parturition mechanism prematurely. Despite years of searching, there is still no broadly effective strategy for preventing preterm labor and most therapies are directed at inhibiting myometrial contractions and improving neonatal outcome. Recent studies with progestins and interleukin-10 (IL-10), however, are showing promise in randomized clinical trials and animal studies. Furthermore, the identification of the Toll-like receptors as upstream mediators of inflammation may offer alternative therapeutic targets for preventing this common pregnancy complication. Preterm labor (PTL) and delivery (PTD) is the foremost problem in modern obstetrics and is defined as labor or birth before 37 weeks gestation (relative to the last menstrual period). Preterm labor is preceded about 30% of the time by preterm, pre-mature rupture of membranes (PPROM), which is defined as membrane rupture prior to 37 weeks gestation. In the older literature all babies that were born less than 2500 g were considered to be premature. Later studies, using better methods of gestational dating, however, revealed that many of these infants were actually delivered at term but were small because of decreased fetal growth (intrauterine growth restriction – IUGR). Now that growth curves and detailed statistics have been established for babies at all gestational ages, babies that are in the lowest 10th percentile at a given date of delivery are termed small for gestational age (SGA). Although the low birth weight (LBW) statistic (born less that <2500 g without reference to gestational age) does not distinguish between babies that are SGA or the result of preterm delivery, it is still used by epidemiologists because it is easily obtained and useful for populations that lack access to adequate prenatal care or facilities for documenting gestational age at birth. Preterm birth complicated about 11.9% of all pregnancies in 2001 and the number of babies born preterm has been steadily increasing for the past two decades . Despite much effort during the past 40 years, nearly all of the improvements with treating this pregnancy complication have been due to advances in neonatology [2, 3]. Indeed, the probability of infant survival for 30 completed weeks of gestation is >90 % and the limit of fetal survival has been extended to 24 weeks . The 2 % of babies born before 32 weeks , however, account for about 70 % of all infant mortality and the infants who do survive are frequently plagued with short and long-term respiratory and neurological morbidities such as bronchopulmonary dysplasia, cerebral palsy, intra-ventricular hemorrhage, patent ductus arteriosus, and poor school performance in later years [1, 4, 5]. Such complications of preterm birth consume approximately 10 % of all pediatric health care costs in the United States and amount to approximately $5.5–6 billion/year in additional expenditures on health, education, and childcare . Much of the difficulty in preventing PTL and PTD stems from the likelihood that PTL is probably the final common pathway of a number of pregnancy complications involving the health of the cervix, fetus, fetal membranes, placenta and myometrium . Known causes of PTL include: poor nutrition, alcoholism, smoking, infection, premature rupture of membranes, multiple gestation, coagulation disorders, and placental abruption . A common component to many of these conditions, however, is inflammation at the maternal-fetal interface – mediated by proinflammatory cytokines. The end result is that the fetus loses its immunological privileges and is targeted for destruction by the innate immune system. Adaptive immunity (caused by classical T-cells) does not seem to play a significant role in PTL even though a previous preterm birth is the strongest predictor of a subsequent preterm birth because gestation length does not decrease in proportion to number of previous deliveries (as it would with a classical graft rejection) and many women have normal pregnancies after a previous preterm birth . One mechanism by which the fetus maintains its immunological privileges in the uterus is to tightly regulate the levels of cytokines at the maternal-fetal interface . Although some physiological roles of proinflammatory cytokines at the maternal-fetal interface have been described with regard to growth of the placenta and decidua , much of the literature supports the concept that excessive or aberrant production of proinflammatory cytokines such as Interleukin (IL)-1β, Tumor necrosis factor (TNF)-α, and Interferon (IFN)-γ at the maternal-fetal interface is harmful to pregnancy. IL-10 is also likely to be an important cytokine because it suppresses the production of proinflammatory cytokines by other cells and numerous studies have documented its production at the maternal-fetal interface [10–12]. Pregnancy is not dependent upon IL-10 production, however, because IL-10 (-/-) mice are still fertile , suggesting that other immunomodulators may also be contributing to survival of the fetal allograft. The best-studied immunomodulator at the maternal-fetal interface is progesterone (P4), which clearly has a role in survival of the fetal allograft . Numerous experiments have demonstrated that progesterone blocks mitogen-stimulated lymphocyte proliferation, improves allograft survival time, modulates antibody production, decreases the oxidative burst of monocytes, reduces the production of proinflammatory cytokines by macrophages in response to bacterial products and alters cytokine secretion of T-cell clones to favor IL-10 production [15–17]. The mechanism by which progesterone exerts its immunomodulatory actions in reproductive tissues is unclear but may involve both direct and indirect actions on immune cells. The concentrations of progesterone that are needed to inhibit lymphocyte proliferation in vitro are well above the KD for its receptors and cannot be blocked by RU486 , suggesting that the effects are mediated through a different type of receptor such as the glucocorticoid receptor. The concentrations of progesterone at the maternal-fetal interface at late pregnancy are in the range of 1–5 μg/mg protein . Therefore, such direct effects of progesterone on immune function described in these in vitro experiments are physiological. Proteins with immunosuppressive activities that are produced under the influence of progesterone have been described for the ruminant endometrium and human leukocytes (reviewed in  and ). Such proteins may alter the proliferation, activation and effector functions of immune cells at the maternal-fetal interface and may provide an alternative, indirect mechanism for P4-mediated immunosuppression. The process of labor involves three physiologically interdependent processes: remodeling of cervix to allow it to stretch open to the width of the reproductive tract, weakening and rupture of the membranes in the region that overlies the cervix and the initiation of rhythmic contractions of increasing amplitude and frequency that ultimately forces the fetus and placenta from the dam. Some of these processes seem to be mediated by the proinflammatory cytokines, suggesting that the immune privileges that the fetal-placental unit has enjoyed during pregnancy are revoked at the time of labor. An inflammatory response during labor may also help to remove placental fragments and prepare the uterus for the pathogens that it will undoubtedly encounter during the immediate postpartum period. In rodent and ruminant models of pregnancy, labor is preceded by a rapid decline in peripheral P4 concentrations . In primates and guinea pigs, however, P4 concentrations remain elevated until the delivery of the placenta [23, 24]. However, blockade of progesterone receptors with RU486 is a very efficient way to stimulate labor in primates [25–27]. This suggests that removal of progesterone causes labor but that this mechanism may not be required for initiating parturition. This discrepancy in the parturition mechanism of primates and rodents but the conserved production of estradiol at term across mammalian species has led to the hypothesis that the estrogen:progesterone ratio is more important at term than absolute levels of these hormones and that increased estradiol abrogates the biological effects of progesterone. Recent studies have suggested that there may be a "functional withdrawal" of P4 in a number of gestational tissues in primates by modulation of progesterone receptors. The P4 receptor has been found to be important to suppressing the inflammatory properties of estradiol in mice . Blockade or abrogation of the function of P4 receptors could permit proinflammatory cascades to occur in utero at term in conjunction with rising estradiol levels. In the decidua there is a significant loss in P4 receptor binding to its response element in samples collected after labor . During labor, there is a significant shift of P4 receptor types in the myometrium from the B-form to the A-form and there was significantly less expression of both receptors on the amnion . The A-form of the P4 receptor appears to inhibit signal transduction of the B-form because myometrial cells that were transfected with both receptors failed to initiate gene expression, whereas those transfected with the B-form only did . In human cervical stroma, a shift from B-form to A-form of the P4 receptor with no total change in P4 receptors has also been described . With the influence of P4 abrogated, IL-8, IL-1β, IL-6 and TNF-α production increases in the human cervix during cervical ripening and labor [33–35]. Immunohistochemical analyses of cervical biopsies have shown that IL-1β is produced predominantly by leukocytes, IL-6 by leukocytes, glandular epithelial cells and surface epithelial cells, and IL-8 is produced primarily by leukocytes, glandular epithelial cells, surface epithelial cells and stromal cells . During labor there is an influx in the number of leukocytes in the cervix that is caused primarily by increased numbers of neutrophils (neutrophil elastase+ cells) and macrophages (CD68+ cells) but not T (CD3+ cells) or B-cells (CD20+ cells) . Proinflammatory cytokines can induce the ripening of the cervix in a number of ways. IL-1β and TNF-α increases the production of matrix metalloproteinase (MMP)-1, MMP-3, MMP-9, and cathepsin S . Furthermore, IL-1β downregulates the expression of tissue inhibitor of metalloproteinase (TIMP)-2, an endogenous inhibitor of MMP-2 . Such proteinases can digest the collagen and elastin fibers in the extracellular matrix of the cervix to further increase cervical compliance. IL-1β can act on a number of cell types to increase the production of cyclooxygenase (COX)-2 and prostaglandin E2 (PGE2), the most effective chemical for inducing cervical dilation in women. IL-1α, which uses the same receptor as IL-1β, has been shown experimentally to increase COX-2 and PGE2 production by rabbit cervical smooth muscle cells . Prostaglandin E2 may then further stimulate labor by increasing the production of proteinases or may play an indirect role, by increasing the permeability of blood vessels for leukocyte trafficking . Nitric oxide (NO), another proinflammatory mediator that is increased at term, may also contribute to vasodilation in order to facilitate leukocyte trafficking . IL-8 causes neutrophils from the periphery to migrate towards the cervix and can activate them to release MMP-8 (neutrophil collagenase) and neutrophil elastase that can digest the extracellular matrix produced by cervical fibroblasts. Increased concentrations of granulocyte-CSF (G-CSF) in the cervix during labor may also stimulate proliferation of the neutrophil subset . The role of IL-6 in the cervix during labor is unclear in normal pregnancy but this cytokine has been used as an effective biomarker for predicting labor. Possible roles could be to stimulate neutrophils, macrophages or other cells in the local tissues to produce additional proinflammatory cytokines that aid the process of cervical ripening such as PGE2 or NO. In the membranes, a similar proinflammatory process takes place as described above in the cervix. During labor, the production of IL-8, TNF-α, IL-6 and IL-1β increases in membranes [36, 41]. Also there are increased amounts of MMP-9 [42–44] but not MMP-2  and decreased levels of the TIMPs . A promoter polymorphism of the MMP-9 gene that is associated with increased production of this enzyme is associated with increased risk for PPROM in African-Americans . TNF-α and IL-1β increase the production of MMP-9 by amnion, but not chorion, explants in vitro . Intra-amniotic infusion of IL-1β into catheterized rhesus monkeys increases the activity of MMP-9 but not MMP-2 . Increased collagenase activity can then weaken the tensile strength of the membranes and lower their threshold for rupture. Proinflammatory cytokines can also increase the production of prostaglandins in the membranes. Stimulation of amnion and chorion cells with IL-1β and TNF-α also increases the production of PGE2 [49–51] via COX-2 . PGE2 may then either cause increased production of MMP-9  or it could cross the membranes to stimulate cervical ripening in the cervix or stimulate contractions by the myometrium. Although the amnion produces significant quantities of PGE2 during pregnancy, there is little effect of this hormone on the uterus or cervix because the chorion and trophoblast produce an enzyme, 15-hydroxyprostaglandin dehydrogenase (PGDH), which converts PGE2 and PGF2α to inactive metabolites. Hormones and cytokines associated with labor such as cortisol, TNF-α and IL-1β have been shown to inhibit the production of PGDH [54–56], which may contribute to increased prostaglandin production during labor. The pattern of cytokine-induced changes described above also seems to occur in the myometrium where increased protein and/or mRNA concentrations of IL-1β, TNF-α and IL-6 are associated with labor [33, 36]. These proinflammatory cytokines have been immunolocalized to the leukocytes in the myometrium, which are increased during labor . The increased concentrations of leukocytes in the myometrium during labor could be due to increased expression of chemokines such as MCP-1 and IL-8 that are also increased during labor [33, 36, 57, 58] and may recruit macrophages and neutrophils to the myometrium. IL-1β and TNF-α stimulate arachidonic acid release, activate phospholipid metabolism  and increase the production of prostaglandins by the myometrium [60, 61]. IL-1β activates a signal transduction system involving NF-κB to increase the expression of COX-2 , which is increased in the myometrium during labor [63, 64], and stimulates the production of PGE2 by myometrial cells . These effects of IL-1β on myometrial cells are similar to the effects of oxytocin which also upregulates COX-2 and PGE2 production by myometrial cells . Oxytocin and PGE2 both increase intracellular calcium concentrations in myometrial cells, which is required for uterine contractions . Although IL-6 has no effect on prostaglandin production by myometrial cells  and is unable to stimulate myometrial contractions , this cytokine may play a role in labor by increasing the expression of oxytocin receptors on myometrial cells  to increase their responsiveness to oxytocin. Like IL-1β, IL-6 can also increase oxytocin secretion by myometrial cells . IL-1β and TNF-α can also increase the production of MMP-9 by myometrial cells, which may be important for detachment of the placenta . Infection is the most frequent cause of PPROM and PTL and is clearly identifiable in over 30% of cases. The organisms most commonly associated with PTL include: Ureaplasma urealyticum, Mycoplasma hominis, Streptococcus agalactae, and Escherichia coli [72, 73]. Koch's postulates for these organisms as pathogens in PTL have been fulfilled in number of studies using primate, rabbit or rodent models of pregnancy [74–79]. Clinical studies have also demonstrated that intra-amniotic infection is associated with PTL, PPROM and other adverse pregnancy outcomes [80–82]. Infection may cause PPROM and PTL by causing a premature activation of cytokine cascades that in turn, activate the parturition mechanisms described above. Amniotic fluid concentrations for a large number of proinflammatory mediators such as IL-1β, TNF-α, IL-6, MMP-9, and IL-8 have been compared between women with intra-amniotic infection and those with sterile amniotic fluids. The overwhelming majority of these studies suggest that production of these and other proinflammatory cytokines is increased during intra-amniotic infection, PTL or PPROM [83–97]. Similar studies conducted using samples collected from other gestational tissues (i.e. cervical/vaginal fluid, placenta or membranes) [34, 35, 91, 98–102] also support the concept that premature activation of cytokines by infectious organisms may result in PTL or PPROM. Administration of bacteria or bacterial products to rodents or primates during late pregnancy causes PTL that is preceded by increased production of proinflammatory cytokines including TNF-α and IL-1β [74, 103–105]. Administration of IL-1β was able to mimic the effects of bacteria by causing PTL, suggesting a causal role for this cytokine in infection-induced PTL [106, 107]. TNF-α did not cause preterm birth but did cause intrauterine fetal death . The source of these cytokines is unclear but may originate from trophoblast cells as well as fetal or maternal macrophages. Cultures of amnion, chorion, and decidual cells produce proinflammatory cytokines in response to bacteria or bacterial products [108–111]. It is also possible that macrophage-derived cytokines can act on receptors on placental cells, which, in turn, augment the production of proinflammatory cytokines at the maternal-fetal interface. Downstream effects of proinflammatory cytokines likely include: increased production of free radicals such as NO, increased prostaglandin production, and increased placental apoptosis. Increased concentrations of NO and PGE2 in amniotic fluid are associated with intrauterine infection [88, 112]. Both COX-2 and iNOS are upregulated in murine gestational tissues in response to LPS . Furthermore, inhibitors of cyclooxygenases and nitric oxide synthases (iNOS) block LPS-induced PTL in mice [114–116]. How pathogens interact with immune cells to stimulate inflammatory processes in the reproductive tract is poorly understood. Recent advances in developmental biology and functional genomics, however, has led to the discovery of a family of receptors, the toll-like receptors (TLRs), that have intracellular domains with high homology to the IL-1 receptor. These proteins are expressed on the surface of many immune and non-immune cells and the extracellular domains of these proteins function as molecular sentinels for biomolecules on different classes of pathogens. For example, TLR-2 recognizes di- and tripalmitoylated peptides, TLR-4 recognizes the lipid A component of LPS. TLR-3 recognizes double stranded RNA which may be released by virus infected cells. TLR-5 recognizes flagellar proteins from pilliated E. coli and yeast cells. TLR-9 enables immune cells to respond to CpG DNA, which is more common in bacteria . Data are conflicting on the recognition of lipoteichoic acid that is produced by Gram-positive organisms with some studies implicating a role for TLR-2  and others a role for TLR-4  for its effects on cells. TLR-1 and TLR-6 dimerize with TLR-2 to detect fine differences in molecular structure with TLR-6 enabling the detection of dipalmitoylated lipids such as MALP-2 from Mycoplasma  and TLR-1 enabling the detection of tripalmitoylated lipids such as those from Borrellia . The functions of the other TLRs are unknown, but they may serve some accessory functions or they may recognize other, undiscovered, mediators of inflammation. In addition to detecting pathogens, the TLRs also may play a role in responding to endogenous mediators of tissue damage or injury. TLR-4 can be activated by stress-induced fibronectin that carries the extra domain A  to increase the production of MMP-9 by THP-1 cells. Surfactant protein A has a similar effect on THP-1 cells but this is mediated via TLR-2 . Heat Shock Protein-70 (hsp 70), gp96 and hsp 60 increase the production of proinflammatory cytokines through both TLR-2 and TLR-4 [124–127]. Extravascular fibrinogen may also modulate chemokine production by macrophages via TLR-4 . The ability for cells to respond to endogenous mediators of inflammation is consistent with the "Danger" model of immunity. This model predicts that immunity is not due merely to the foreignness of antigens but also for their capacity to do damage and is based on numerous observations that tissue injury or necrosis is associated with greater immune responses (such as the need for adjuvants to get an effective immune response) . Toll-like receptors appear to be a missing link between innate and adaptive immunity because the different receptors bind ligands that are more prevalent on different classes of pathogens and may be able to direct adaptive immunity to respond to a particular group pathogens. Recent studies have shown that TLR-2 and TLR-9 agonists stimulate a subset of the genes that are normally induced by TLR-4 [130–132]. For example, the proinflammatory cytokines and chemokines IL-1β, MIP-1α, MIP-2, IL-6, TNF-α and IFN-γ are induced by murine macrophages in response to both TLR-2 and TLR-4 agonists, however, iNOS, IL-12p40, IP-10 and MCP-5 are produced primarily in response to TLR-4 agonists [130, 131]. In human dendritic cells, TLR-2 agonists more efficiently increased production of IL-8 and IL-23 than did TLR-4 agonists . One of the genes that is induced by TLR-4 but not TLR-2 agonists is IFN-β that functions as a pivotal factor between array of genes produced by TLR-2 and TLR-4 agonists . Stimulation of macrophages with TLR-2 agonists and IFN-β results in a cytokine pattern that is similar to that induced by TLR-4 ligands . How the TLRs mediate inflammation at the maternal-fetal interface is only beginning to be studied. A better understanding of these proteins and the signal transduction cascades that they mediate may explain why some pregnancies are complicated by PTL and PPROM whereas others are only affected by PPROM. More investigations into the endogenous activators of the TLRs may also explain how PTL and PPROM can occur in the absence of infection (e.g. preeclampsia, multiple gestation, teenage pregnancy, or due to excessive tobbacco and alcohol consumption). These molecules may be excellent targets for therapeutic strategies because they are upstream mediators of the proinflammatory cascade that ultimately results in PTL. Messenger RNA for all of the TLRs is present in the human placenta  and studies on pregnant mice have revealed that expression of TLR-2 and TLR-4 is present throughout the second half of pregnancy . The human term placenta also expresses TLR-2 and TLR-4 in the syncytiotrophoblast, which would be in direct contact with invading pathogens . Although the levels of TLR-2 and TLR-4 expression did not increase in the human placenta during labor or in response to TNF-α, these receptors do seem to be functional because IL-8 and TNF-α secretion by placental explants was increased after incubation with zymosan (a TLR-2 agonist) or LPS (a TLR-4 agonist) . One genetic polymorphism for TLR-4, Asp299Gly, results in decreased receptor function and was associated with a pre-disposition to PTL in a Finnish population . This result is surprising, because C3H/HeJ mice, which that lack a functional TLR4, are resistant to PTL induced by E. coli [138, 139]. Classical strategies for treating and preventing PTL have focused on blocking the myometrial contractions with β-mimetics, oxytocin antagonists, cyclooxygenase inhibitors and magnesium sulfate. Although there are many clinical studies evaluating these treatments, the results are conflicting, suggesting that no single tocolytic treatment may be effective for all women in PTL. Furthermore, there can be significant risks with some of these treatments including cardiac problems and patent ductus arteriosus. Using the assumption that most PTL is caused by intrauterine infection, a number of randomized clinical trials have been conducted to determine if antibiotics can improve pregnancy outcome. These trials have yielded conflicting results due to differences in inclusion criteria, study design, organism studied and the static vs. cidal activity of many antibiotics. Due to the correlative role of inflammation in PTL, some of the newer strategies being investigated are focused on the antiinflammatory effects of IL-10 and progesterone. Administration of LPS to pregnant rats between gestation day 14 and 17 causes extensive intrauterine growth retardation, fetal death and low birth weight . This is associated with increased production of TNF-α and NO in the placenta and increased numbers of apoptotic cells . Co-administration of IL-10 to LPS-treated dams improved fetal outcome by restoring birth weight, increasing liter size and decreasing placental TNF-α, NO and apoptosis . Intravenous administration of IL-10 also prevents preterm birth caused by intrauterine infusion of LPS in rats . IL-10 also decreased the production of proinflammatory cytokines in the brains of pups born to dams that received 107 CFU E. coli via intrauterine injection during pregnancy . Increased production of proinflammatory cytokines in fetal or neonatal brains is associated with periventricular leukomalacia, a major risk factor for cerebral palsy . These results suggest that IL-10 may be helpful in reducing the incidence of PTL and the resulting neonatal morbidity. IL-10 may function by decreasing LPS-stimulated IL-1β that could prevent the induction of COX-2 and ultimately lead to decreased PGE2 in the gestational tissues . Alternatively, IL-10 may increase the catabolism of prostaglandins by the membranes. IL-10 blocked the TNF-α and IL-1β-induced decreases in chorion PGDH expression . Furthermore, IL-10 blocked IL-1β-induced PTL in rhesus monkeys, indicating that IL-10 may function at steps downstream from IL-1β in vivo . Progestins have also been shown to be effective in preventing PTL and delivery. Administration of pharmacological, but not physiological levels, of progesterone to mice delayed PTL in response to intrauterine injection of E. coli . In women with a history of preterm birth, the synthetic progestin, 17α-OH progesterone-caproate significantly reduced the rate of delivery at 30, 32, or 37 weeks gestation . Although the results were highly significant, this study is complicated by an unusually high rate of repeat PTD in the control group (>50%), suggesting that the effect may be limited to only a subset of women who succumb to PTL. A similar study, however, demonstrated that 100 mg P4 via vaginal suppositories administered daily significantly lowered the rate of PTL (to 13.8 %) and was characterized by a more reasonable rate of PTL in the placebo group (28.5 %) . Progesterone, however, should be given cautiously to women because animal studies have indicated that progesterone makes the uterus more susceptible to bacterial infection [149, 150]. Widespread P4 treatment without simultaneous prophylactic antibiotic therapies could lead to increased growth of bacteria in the uterus and cause more infants to be born with bacterial sepsis. Neither of the studies referenced above were designed to have had sufficient power to detect a reduction in most measurements of perinatal morbidity and mortality and meta-analyses of previous studies demonstrated no improvement in neonatal outcome for women who received 17α-hydroxyprogesterone caproate . However, decreased relative risk for intraventricular hemorrhage and requirement for supplemental oxygen was observed in the study by the network of maternal-fetal medicine units . Nevertheless, these studies have led to a flurry of research that is now underway to determine if progestin supplementation is effective in women with multiple gestations, and whether other routes of administration and other types of synthetic progestins are effective. Hopefully these new treatments either, alone or combined with other therapies, will reduce the huge burden of infant morbidity and mortality caused by PTL and PPROM that is placed on families and society. Model for biochemical cascades involved with preterm labor. Toll-like receptors recognize conserved bacterial motifs or proteins that are indicative of cellular damage to increase the production of arrays of proinflammatory cytokines that may differ between TLRs. These cytokines and chemokines can increase one another to augment their production, recruit neutrophils (NΦ) and macrophages (MΦ) to the maternal-fetal interfaces, and increase the production of downstream mediators of inflammation- the most important of which seem to be prostaglandins and matrix metalloproteinases. These downstream mediators have varying effects in different tissues. 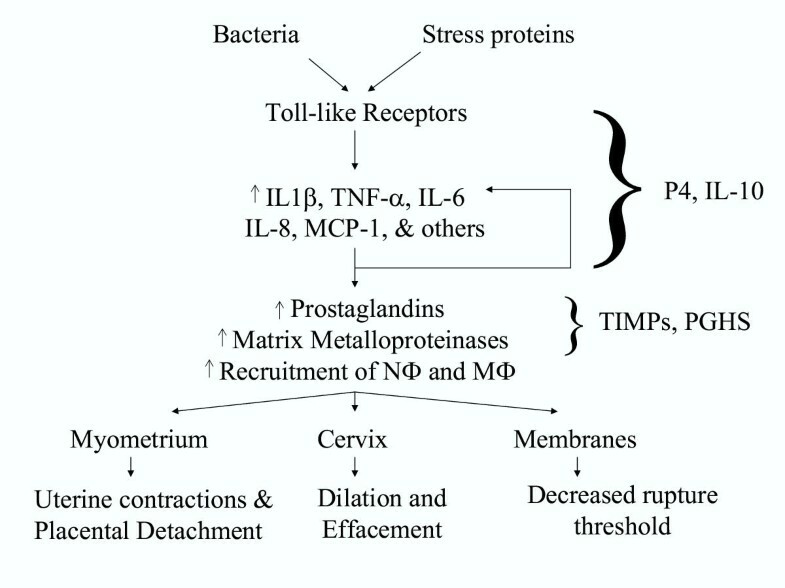 In the myometrium, prostaglandins contribute to increased uterine contractions and matrix metalloproteinases may contribute to detachment of the placenta. In the cervix, these mediators cause degradation of the extracellular matrix resulting in effacement and dilation. Increased activity of matrix metalloproteinases in the membranes reduces the pressure required for membrane rupture. During much of pregnancy, immunosuppressive substances such as progesterone (P4) and IL-10 suppress these proinflammatory cascades and downstream regulators such as the TIMPs and PGDH may also play a role in prolonging pregnancy. Current literature suggests that excessive levels of stress proteins or infectious organisms may override the protective effects of such molecules to cause preterm labor and/or PPROM. The author would like to thank Dr. M. Sean Esplin and Mr. Steven Hamblin for helpful discussions and for critically reviewing this manuscript.